Native Americans of the Upper Mississippian culture lived on the site, dating back to 8,000 B.C. They not only established a thriving village but, in about 2,500 B.C., began using the site as a burial ground. They constructed elaborate mounds,creating a "mini-Cahokia" in what is now Forest Home. 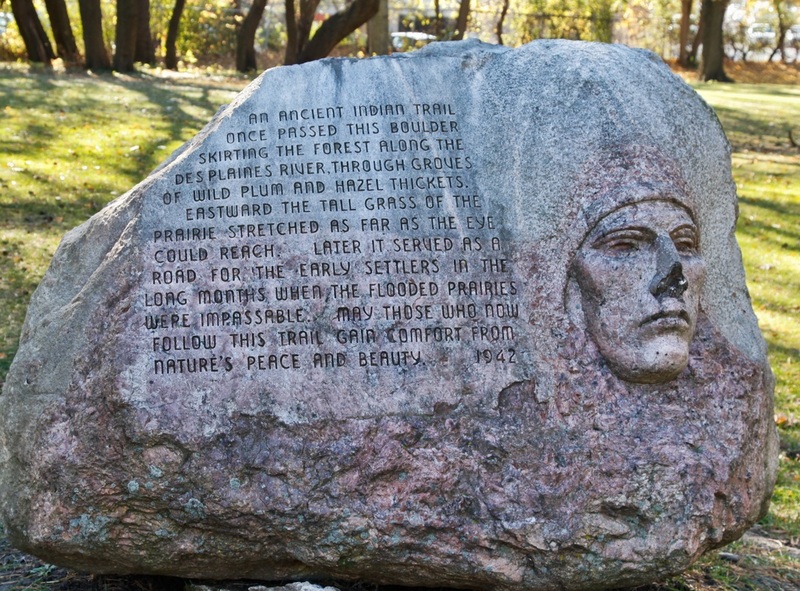 Native Americans were expelled from this site in 1832 The Potawatomi had been guaranteed this land by the Treaty of Prairie du Chien in 1829, but were forced to move west just a few years later, after the Black Hawk War of 1832. 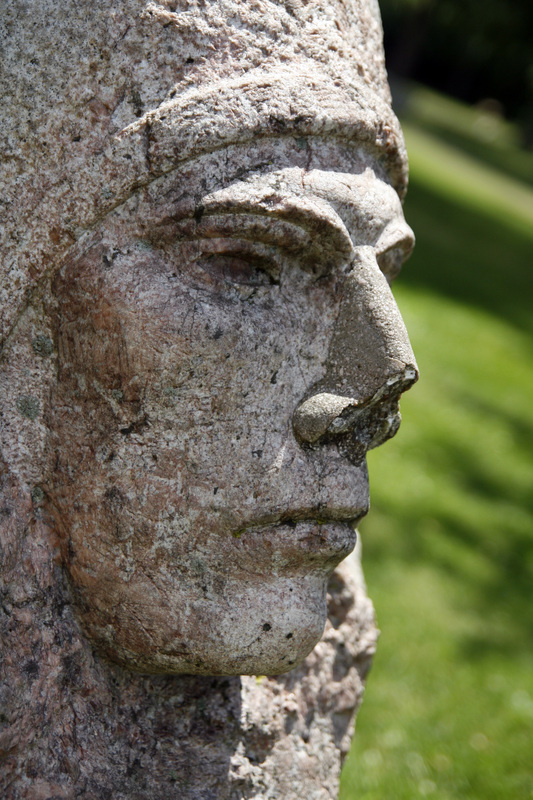 A trapper, Leon Bourassa, and his Potawatomi wife, Margaret, remained on the land near the ancestral graves. Ferdinand Haase, who is considered the founder of Forest Park, bought and farmed the land in 1851. When Ferdinand Haase first tried to till the soil, he made a startling discovery. In a gravel bed approximately 150 yards east of the Des Plaines River, Haase uncovered the bones and tusk of a huge mastodon just ten feet below the surface. He also unearthed several mounds that contained human remains as well as artifacts and ornaments. "Four score of graves have been unearthed," wrote his daughter-in-law, "and their contents exposed to human eyes. Each mound contained about ten bodies surrounded by the individual's personal property . . . knives, wampum, kettles, crosses, arm bands, beads, and other ornaments." The Historical Society of Forest Park has some of these artifacts on exhibit at the Forest Park Public Library. An ancient Indian trail once passed this boulder skirting the forest along the Des Plaines River, through groves of wild plum and hazel thickets. Eastward the tall grass of the prairie stretched as far as the eye could reach. 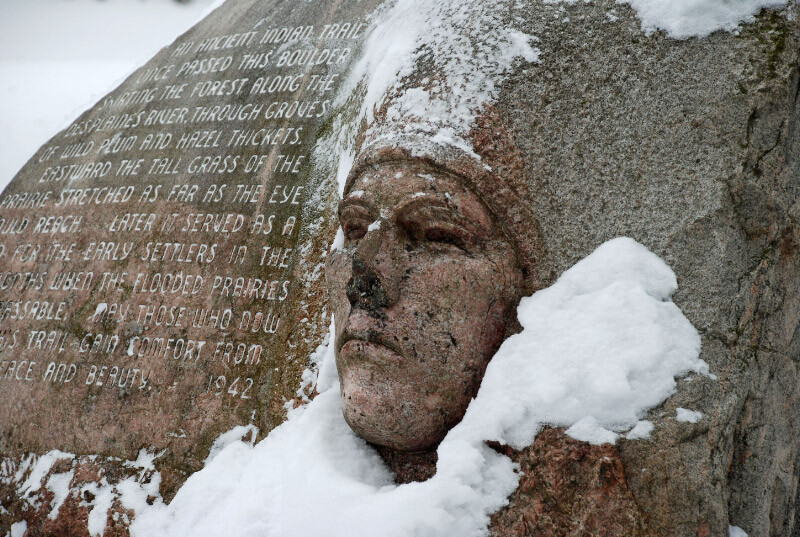 Later it served as a road for the early settlers in the long months when the flooded prairies were impassable. May those who now follow this trail gain comfort from nature's peace and beauty. Unfortunately the nose of the monument has been damaged. This is the site of a village and burial ground of the Potawatomi Indians from ancient times until 1835 when they were exiled to lands beyond the Mississippi. Later this locality was known as Indian Hill. Here stood the cabin of Leon Bourassa, the trapper. His Indian wife, Margaret, had been reared in this grove and, after the exodus other tribe, she chose to remain near the graves of her ancestors. 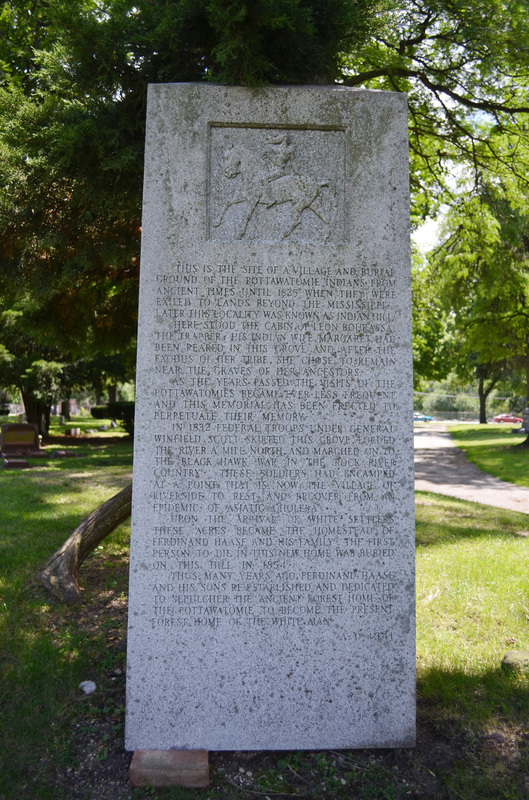 As the years passed the visits of the Potawatomi became ever less frequent, and this memorial has been erected to perpetuate their memory. In 1832 Federal troops under General Win field Scott skirted this grove, forded the river a mile north, and marched on to the Black Hawk War in the Rock River country. These soldiers had encamped at a point that is now the Village of Riverside to rest and recover from an epidemic of Asiatic cholera. Upon the arrival of white settlers these acres became the homestead of Ferdinand Haase and his family. The first person to die in this new home was buried on this hill in 1854. 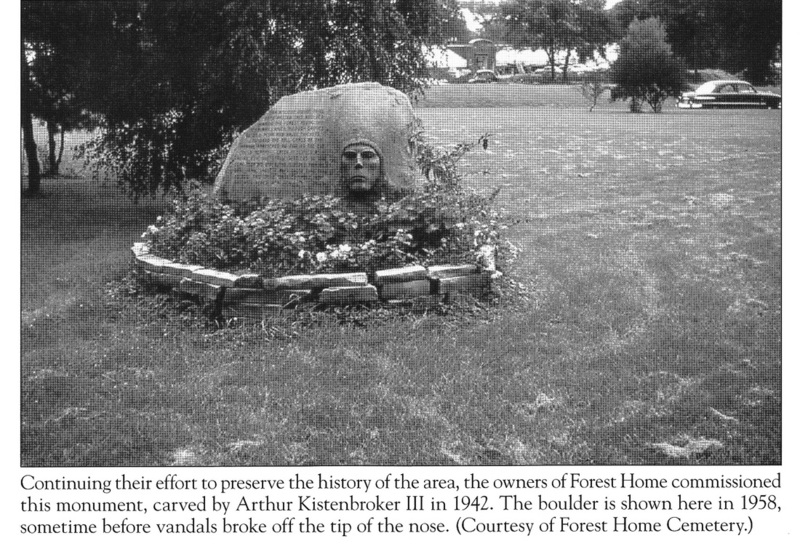 Thus, many years ago, Ferdinand Haase and his sons re-established and dedicated to sepulcher the ancient forest home of the Pottawatomie to become the present Forest Home of the white man. Atop the mound are the graves of three members of the Zimmerman family, Ferdinand Haases in-laws, who, in the 1850s, were the first non-native burials in what is now Forest Home Cemetery.